Wild creatures visit our small suburban garden. It is quite bushy. Birds find it on their travels. Some pass through; others live here permanently. The above image was taken at sunset through wattles in the back garden. For various occasional, chronologically-arranged notes on the wildlife and plants in our garden, or in other garden-like places in suburban Melbourne, please go to the Melbourne suburban garden notes page. Bibio imitator on Hop Goodenia Goodenia ovata 18 Nov 2018. 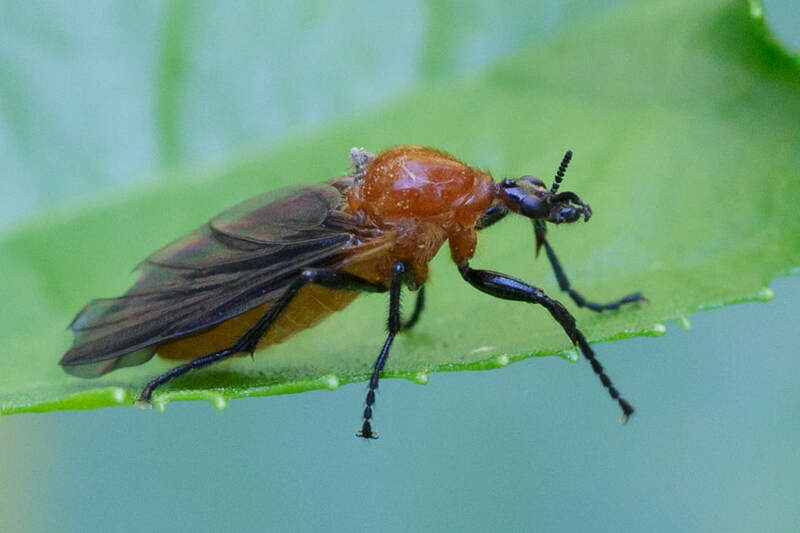 This fly is in the order Diptera and family Bibionidae. 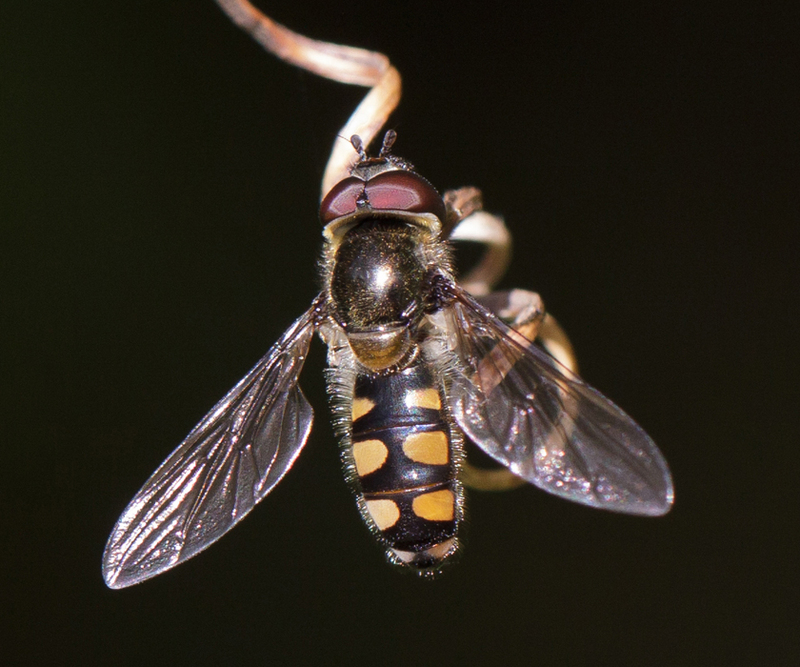 One of its common names is Compost Fly. 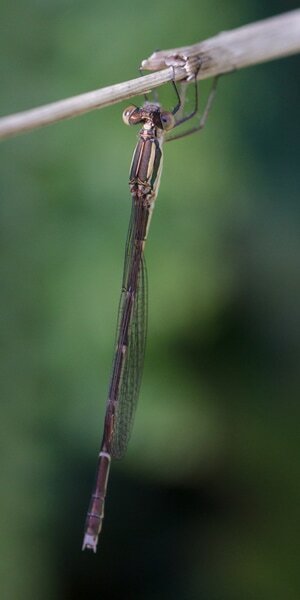 This damselfly is possibly a Metallic Ringtail Austrolestes cingulatis. 25 Jan 2017. 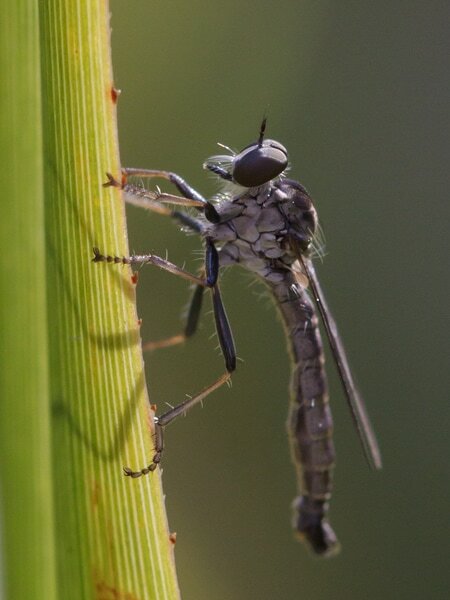 Robber fly, Order Diptera, family Asilidae, perched on a Blue Flax Lily Dianella tasmanica leaf. 25 Jan 2017. 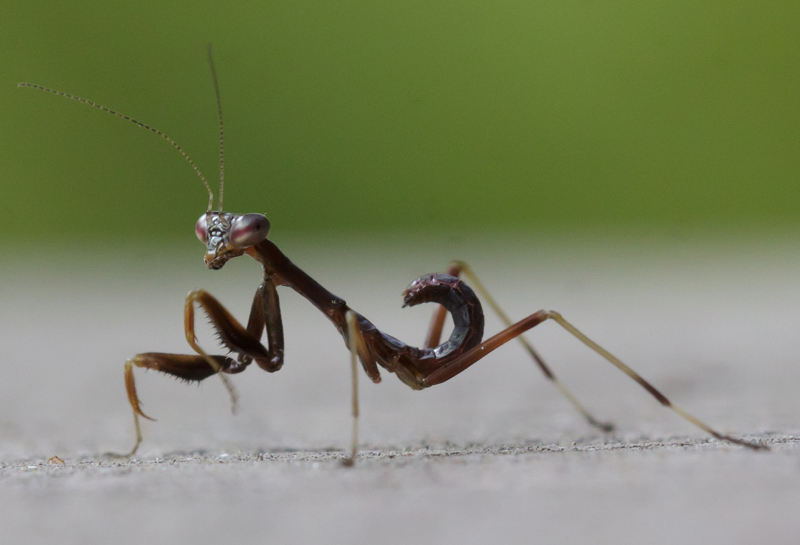 A newly-hatched Praying Mantis looks rather like an ant at first glimpse, but a closer look shows what it is. This one was tiny at less than 1cm long. Adult females deposit their egg cases under the railing of our back veranda. 17 November 2015. The underside of a Hazel Pomaderris Pomaderris aspera leaf is rather attractive close up with its stellate hairs. They must protect the surface to some extent, from dehydration or insect attack. 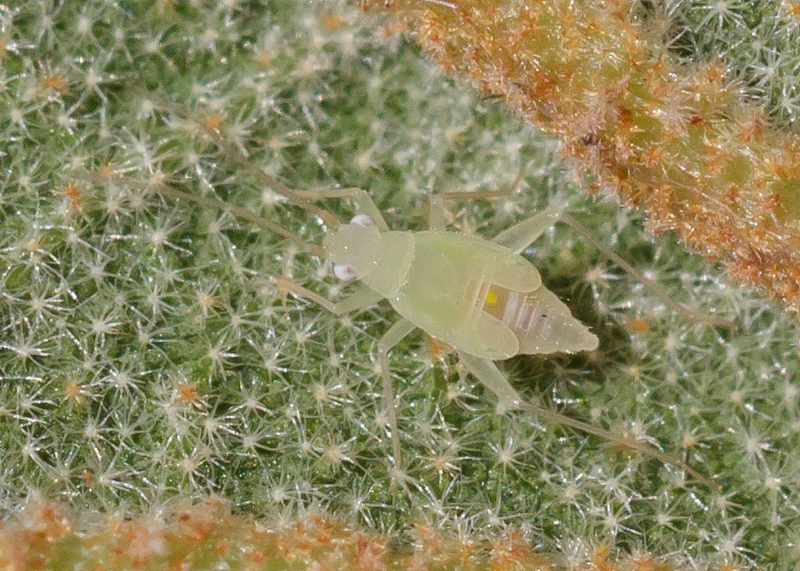 I guess this insect is an aphid or something similar. It is tiny with its body being only a couple of mm long. 27 Oct 2015. 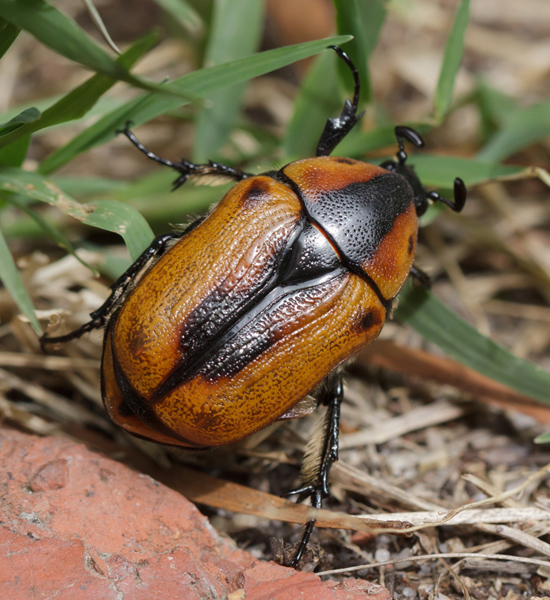 This Cowboy Beetle Chondropyga dorsalis flew down into our garden (20 Jan 2015) and began to clamber around in the grass. It looked like it might stay for a while, so I ran for the camera. The picture on the right shows the pattern of colour and texture.on the beetle's dorsal surface. A small part of the right hind wing is visible under the right elytron (hardened forewing). Beetle antennae come in many different shapes and sizes. The Cowboy Beetle's antennae are quite distinctive with a row of small segments near the base and a large and shiny structure at the apex. 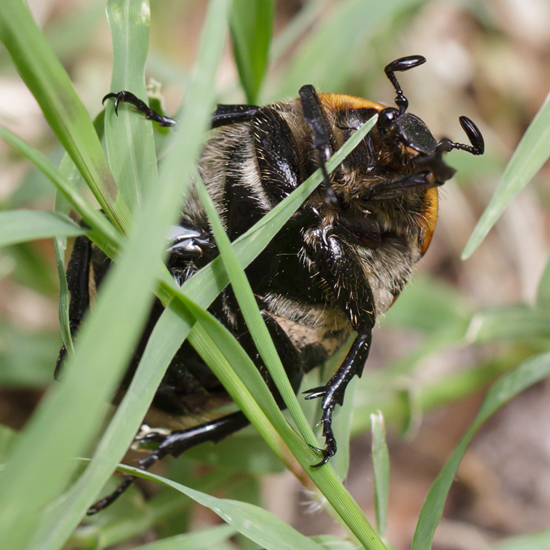 This beetle constantly moved its antennae about as it climbed in the grass. 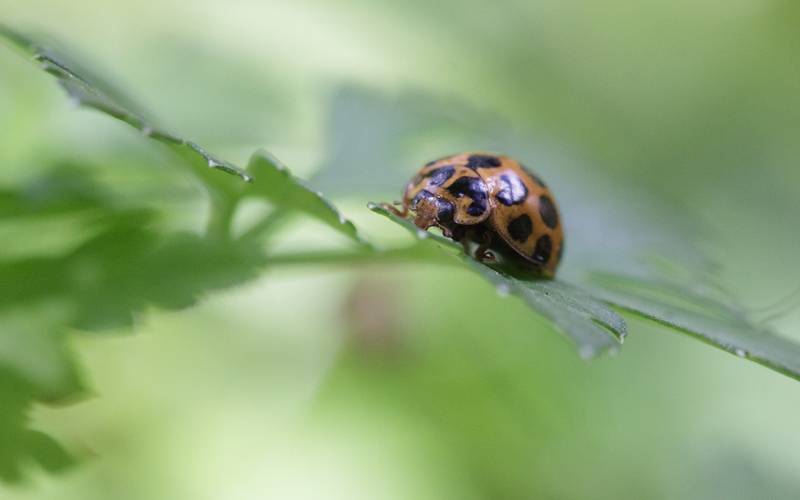 I sat still taking numerous photos as the beetle gradually approached. This image shows the large, dark compound eyes near the base of each antenna. 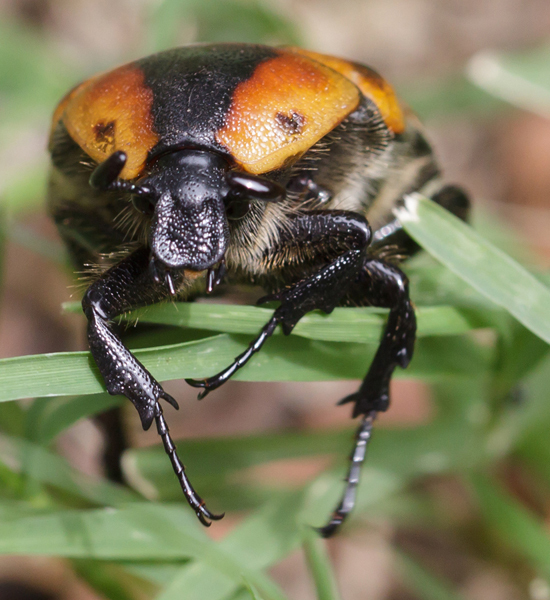 The eyes can also be seen in the other photos, which indicates that the beetle probably has a very wide field of view. At the mouth, the ends of the two pairs of palps are visible below the upper lip (labrum). One pair of palps is attached to the maxillae and the other to the lower lip (labium). The upper parts of each leg (femur and tibia) look well-armoured. The lower part of the leg (tarsus, consisting of a series of segments) ends in a pair of claws. 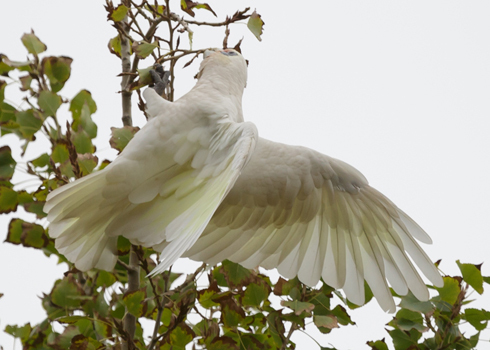 The autumn flocks of Little Corellas have arrived as usual. They spend much of their time on exotic trees such as this tall Poplar in another garden in my street, but visible from my back garden. 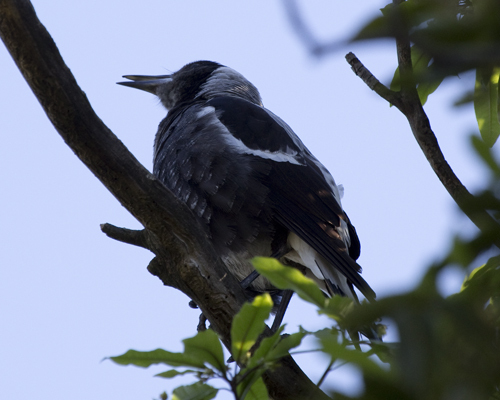 Australian Magpies are in or near the garden all year. 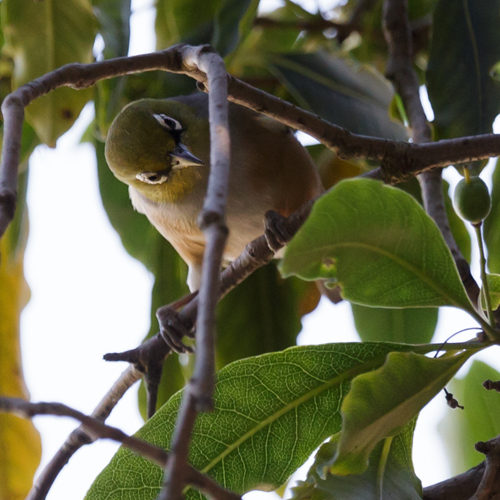 Lately they have been chortling at length while perched on a high open branch on the Pittosporum. The wattle outside my study window is often used by birds. 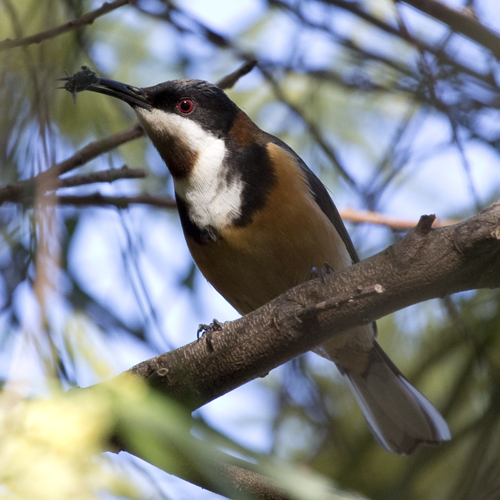 This Eastern Spinebill had just caught a fly. It spent some time preparing it before swallowing. 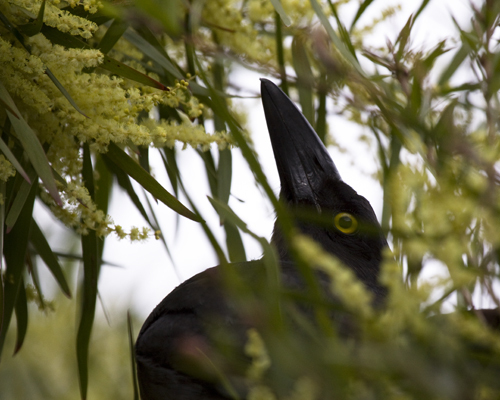 Pied Currawongs visit in winter. The tree is the same as the one above. They are also present in Spring (written Nov 2015). 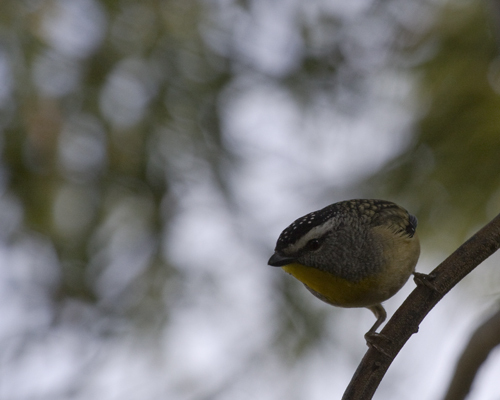 I could hear this Spotted Pardalote and went to investigate. 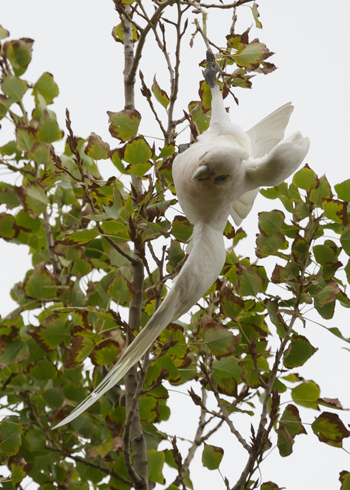 It was in the same tree as the Spinebill and Currawong above. Writing in August 2013, I have been hearing the calls of Spotted Pardalotes every day lately. 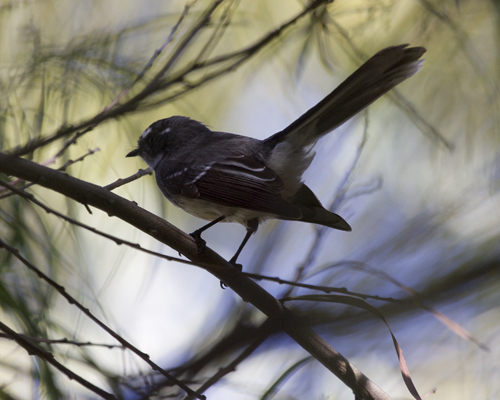 Grey Fantails are rare visitors to our garden. Same wattle tree. (or the same one) appeared in March 2016. In this photo it is in the same tree that is mentioned above. 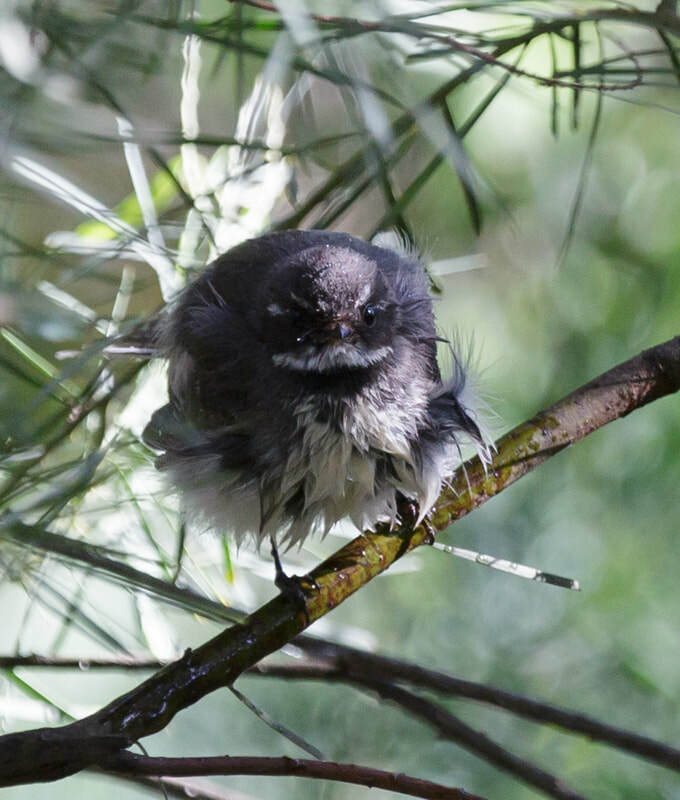 A Grey Fantail spent much time in and out of one of the bird baths on a mild spring afternoon, October 2017. One or two have been here regularly from time to time over the past month or two. A house down the street from us was offered for auction a couple of weeks ago. The back garden has been destroyed. Half has been replaced with a wide wooden deck and the rest with concrete tiles. It's an eyesore and a shadeless environmental wasteland. 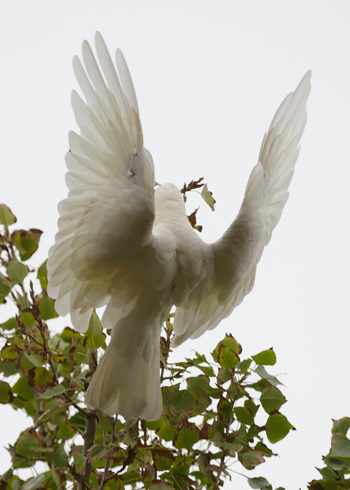 No Fantails or any other birds or wildlife for them. No wonder the house didn't sell. Brown Thornbills are permanent residents in our garden. 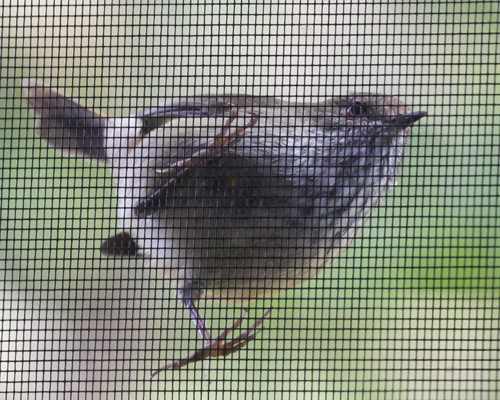 This one regularly lands on the wire screen on the window next to my desk. This photo was taken in June 2014, but it still visits the window (writing in Oct 2015). 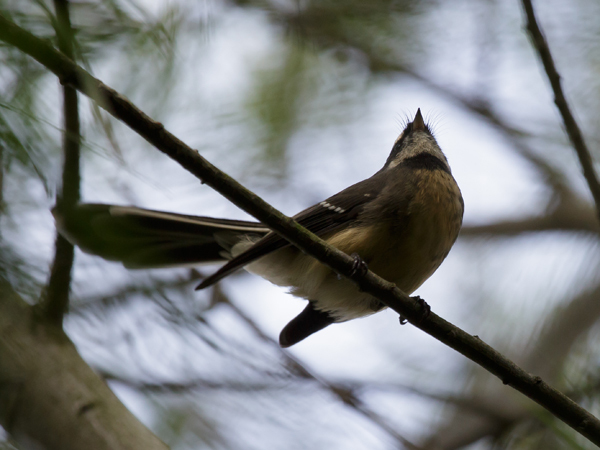 The pair of thornbills has bred recently and the tiny calls of the young ones can be heard as they follow their parents when foraging in the trees in the garden. Still landing on the window wire March 2016, and Jan 2017. 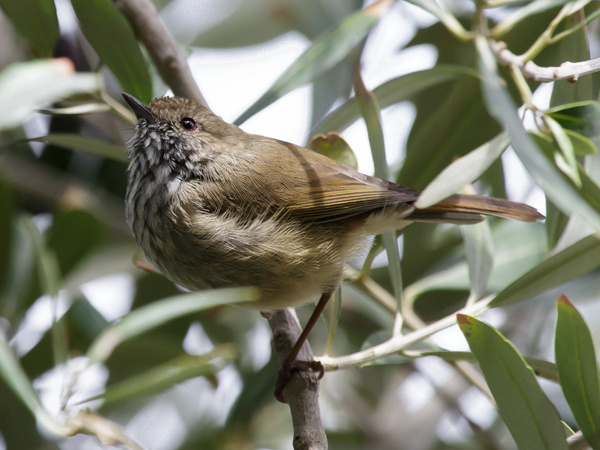 A Brown Thornbill in an olive tree just over the fence in our neighbours' garden. 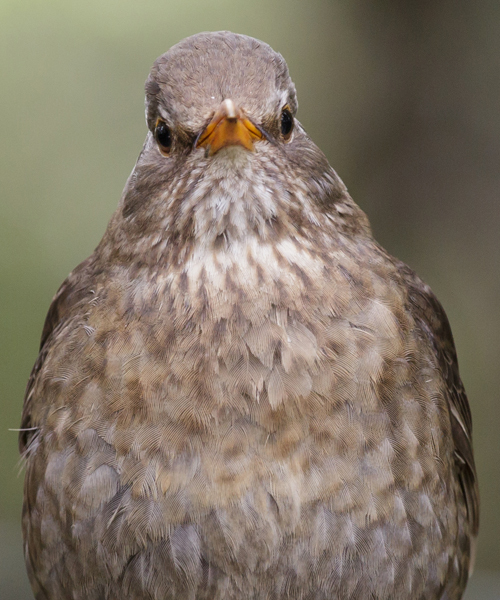 There have been several Brown Thornbills in our gardens recently. Common Blackbird on the clothes line in the middle of the garden, pausing while feeding her new fledgling. Earlier, she perched for a while on a bare stem, a writhing centipede in her bill. That was when I went for the camera, but she didn't return to that perch. The male used the perch briefly, but was too quick for me. It is hot and windy today, unusual for October. 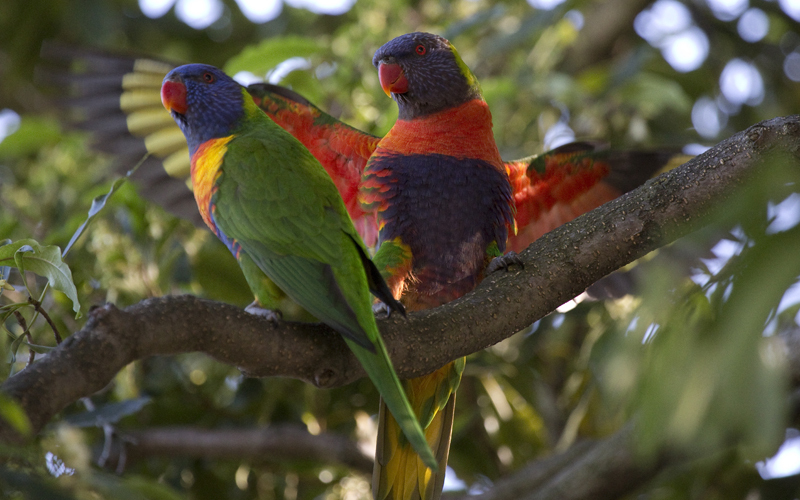 Other birds that regularly use our garden are Red and Little Wattlebirds, Little Raven, Common Myna and Spotted Dove. There is an occasional Magie-lark. 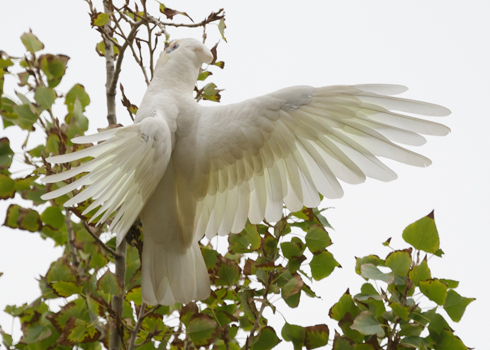 Large flocks of Little Corellas visit now and then out of the breeding season. Sometimes a raptor appears. I'm waiting for a Crested Pigeon to arrive.